* Derivatives book is down to $1.3 trillion from 1.5 (more than $200B in CDS contracts were terminated). This seems like a huge number, but it's the gross of longs and shorts. Unrealized gain on this book was $636million as underlying assets rallied. * Regulatory Capital CDS book (the one that brought down the firm) continues to wind down -- now $177 billion vs. $192 billion in first quarter. * Operating results: premiums down 20% on P+C and down 15% on life insurance - domestic life insurance business down 50%. This is to be expected, given the economy and total brand destruction in the US. * AIG's life insurance business in Asia premiums grew 50% year-over-year. The goal is to do an IPO of this entity early next year with the proceeds going to the taxpayer. * AIG drew $1.2 billion on $30 billion Fed Preferred facility to capitalize the domestic life insurance business. This funding is effectively equity, making domestic life insurance subsidiaries well capitalized. * They paid down $7B under the Fed Secured Facility mainly through proceeds from asset sales through July 29, 2009. * Total amount outstanding on the Fed Secured Facility is $44 billion at quarter-end and $40 billion at July 29, 2009 with $20B of available capacity. So liquidity is not an issue. * Restructuring expenses during the quarter were $340mm, half of that in 1Q09. * AIG continued to roll its commitment to fund AmGen and ILFC cash needs for next 12 months. Both of these entities are leveraged and pose risk because of near term maturities and "specialty financing" assets that are hard to finance in the capital markets (similar to CIT). Support will now be extended through August 15. 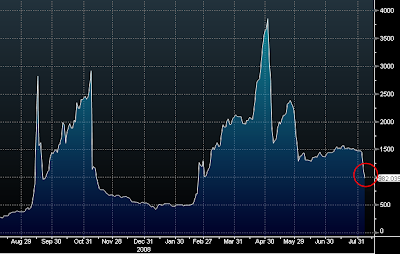 As a whole, the market was fairly impressed and CDS spreads have tightened significantly. With regard to the $249 million reserved for compensation/retention, that's the cost doing business. That is what it takes to retain talent. The focus should be on keeping AIG profitable, so that the shareholders and creditors - the US taxpayers - can get their money back, and maybe even (as unpopular as it is these days) make some money on AIG.